I love creating a tablescape for Thanksgiving dinner. I choose the colors, the dishes and all the perfect details but I also love creating a fun dessert table that is less serious. Makes sense, although, dessert is very serious that day. Also, my Thanksgiving DIY could be used for a kids table. I found a sack of wood at a thrift store for $2.99. 6 in total. They had numbers on them and look like they were used for table numbers. Probably at a wedding. Someone had a DIY wedding. Which gets my seal of approval, but now this wood has a new purpose. They also had blocks glued on the back so they stand up. I used paint, some wood oval shapes and some faux leather from a an skirt I cut up. I also used a paint stick that comes with paint from the store. I cut it for the male pilgrim’s hat and the Native American’s headband that I covered in faux leather. All materials I had in my craft room already. This one is my favorite. I painted pink feathers because it works well with my pink colored pumpkins. I used the same faux leather for the braids. Here they are on my main dining room table. I truly love Thanksgiving day and even the cooking. I love the parade and running a Turkey Trot too. Which reminds me, I need to be running to get ready………… BRB! Keep this season thankful, cute and that dessert table full of goodies! Always remember to Create.Share. Inspire. 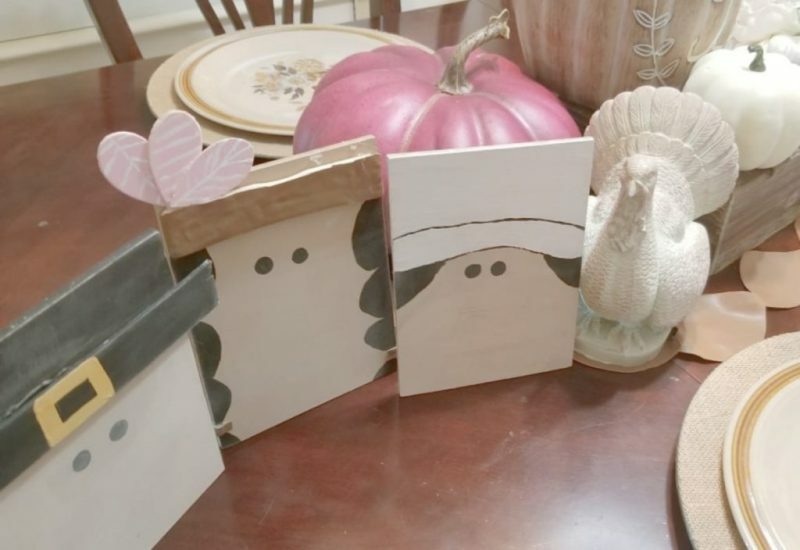 These are so cute for Thanksgiving! I’ll be featuring them tonight at Merry Monday.